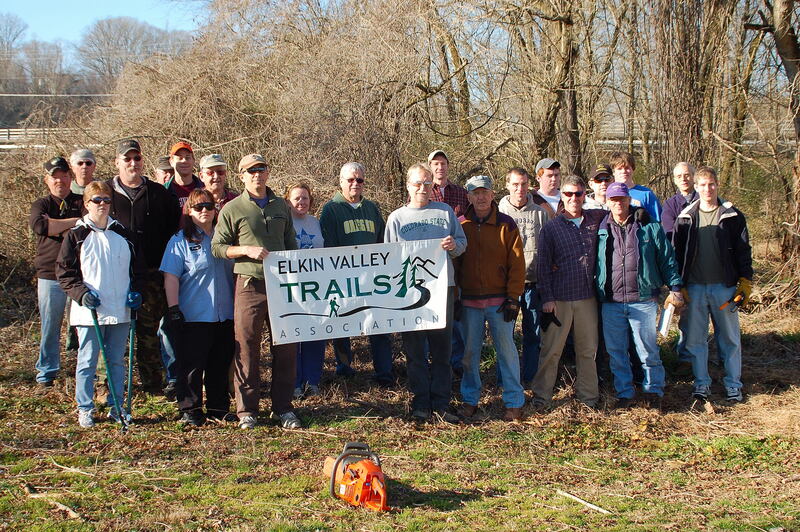 On Saturday, February 18th, 30-plus local volunteers from the Elkin Valley Trails Association (EVTA) met at Crater Park to open a walking trail and campsite alongside the Yadkin River in Elkin. The trail follows the Yadkin River from the canoe landing toward the McNeil Bridge. The EVTA is a non-profit affiliate of NC Rail Trail, Inc. that works as a subcommittee of the Elkin Recreation and Parks Department. The EVTA is working to improve and develop trails through out the Elkin Valley including the Yadkin River Paddle Trail, the Overmountain Victory Trail, the Elkin & Alleghany Rail Trail and the North Carolina NC Mountains-to-Sea Trail that connects Clingman’s Dome in the southern NC mountains to Jockey’s Ridge on the Outer Banks. This workday was chosen in conjunction with volunteers from Weyerhaeuser headed up by Howie Neely. Eight volunteers including their plant manager, Debbie Tadlock and operations manager, Jesse Merica were in attendance. Weyerhaeuser is working to obtain a grant for trails development. Also joining the workday was Tim Hendrix, plant manger of Vulcan Materials Inc. EVTA hopes to work with Vulcan on the Yadkin River trail just down river. Our next workday is on Saturday, March 10th. Joining us on this day would give you a chance to walk the next one mile of trail on the E & A Rail Trail from above the Shoe Factory Dam to the City Reservoir along the Elkin Creek/River. This is a beautiful stretch of water and where we plan to place a second trout fishing opportunity in conjunction with the NC Wildlife Commission. If you are interested in learning about how to participate you may contact Denise Lyon at myfrienddenise@gmail.com and she will add your name to the EVTA email list that we use to sent out activity announcements. Please join us for fun, exercise, a bit of nature, a bit of past history and history in the making.